Some gigs turn out exactly how one expects, and are fantastic because of it, especially when it is someone who doesn’t swing by the local venues all that often. Fans (at least, if there are any others like me) spend years listening to the artists’ albums, developing an imaginary setlist for when the tour finally makes it to their city. The risk here is that if the real life show doesn’t conform to the high standards of the imagination, one might be let down. And so it is with Andrew W.K. I’d skipped his combination lecture/concert in 2007 at the Toff, since I’m not a fan of the whole spoken word show thing, and I’d heard rumours that he not only took to the stage alone to a back up tape, but that the tape didn’t even have the lyrics removed, karaoke style. The rumours were reportedly true, though the reports of it nevertheless being a night to remember, with most of the audience winding up on stage by the end of the show, and leaving me wondering if I’d made the right decision. Even if the show hadn’t opened exactly how I had fantasised, it was still a good night. I arrived to an already packed floor, and contended with more of a throng waiting at the bar than any kind of queue, and was just able to collect a pair of bourbon mixers and a bottle of water before a modest applause from the crowd in the sunken dance floor indicated some action on stage. 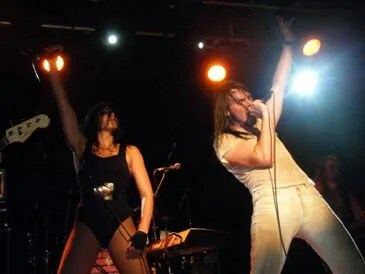 The band were starting, and as I waded through the more conservative in the back, the earlier applause was topped by a roar as Cherie Lily, Andrew W.K.’s Party Hard girl wife appeared on stage, uniting the entire pit in a fist-pounding acompaniment to the instrumental opening. I passed beneath the air-punching to the front of the stage just in time to see Andrew W.K. headbang across the short stage to the central piano. He held out a hand to the audience, managing to settle the excited crowd only slightly, before inciting them into further intensity by launching loudly into It’s Time To Party. Up close, those famous whites aren’t quite so white, but it answers a question I have had for a while – how would you keep a white uniform clean when partying professionally? I know I couldn’t. And I guess Andrew W.K. can’t keep them so pristine either. But who cares? And who cares that the show didn’t open according to my plan? I was impressed anyway. Things like Party Hard girls can go either way, but in this case, it worked. Even some of the lesser known songs from the notoriously hard to come by Close Calls with Brick Walls were perfect material for bouncing along to, even if all we could shout along was nonsense, and the catch phrases this artist gave us. The show maintained breakneck speed throughout, though nobody – at least, no one in the front rows – seemed to tire. How could we, when we had Andrew W.K. literally on top of us? The energy was high from the beginning of the show to the final pounding intonations of closer Party Hard, and was even ongoing as hoards of sweaty kids spilled into the surrounding convenience stores to rehydrate before the afterParty. I know it is still early days, but this gig is going to provide some serious competition for show of the year.